A graded stakes-winning son of top sire CANDY RIDE! A talented runner at 2, EAGLE won at first asking going five furlongs and finished his juvenile campaign with a record of 4-2-1-1 and a placing in the Grade 2 Kentucky Jockey Club Stakes. EAGLE then developed into a top handicap horse with a win in the Grade 3 Ben Ali Stakes at Keeneland and six graded stakes placings, including the Grade 1 Stephen Foster Handicap, Grade 2 Alysheba Stakes and Grade 2 New Orleans Handicap. He ran first or second in 14 of 24 starts with earnings of $754,186. His sire, CANDY RIDE, is one of North America’s top stallions with worldwide earnings of nearly $100 million, including Horse of the Year GUN RUNNER! 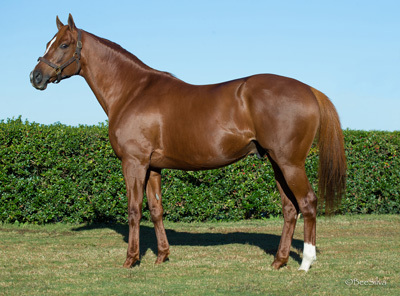 EAGLE is the only son of CANDY RIDE standing in Texas!